*By checking this box, I agree that the intended recipient of this gift box is aged 18 years or older. 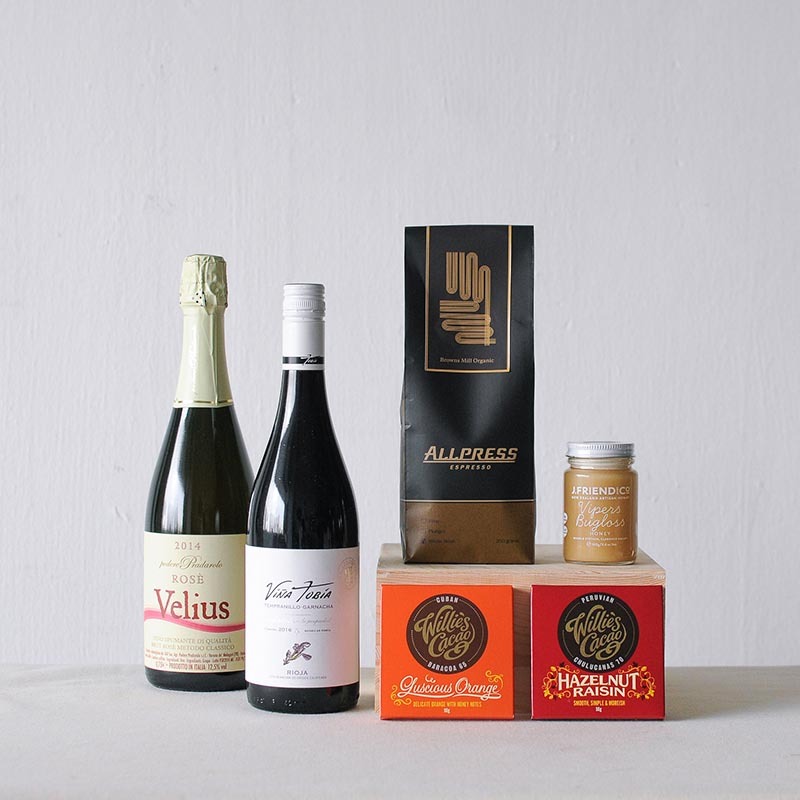 The Pantry Selection gift box is for the hosts and hostesses — honey, coffee beans, and (of course) wine will set you up to be ready no matter what time of the day guests come knocking. 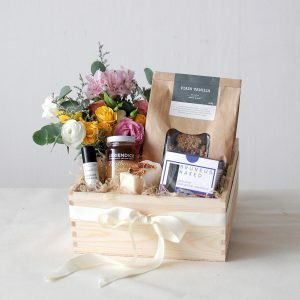 Accompanied by a posy of beautiful blooms perfect for a side table or small coffee table, some of these pantry staples have been sourced from environmentally-conscious businesses, including a bottle of sustainably-farmed rosé and organic regionally-distinct honey made by local beekepers in New Zealand. 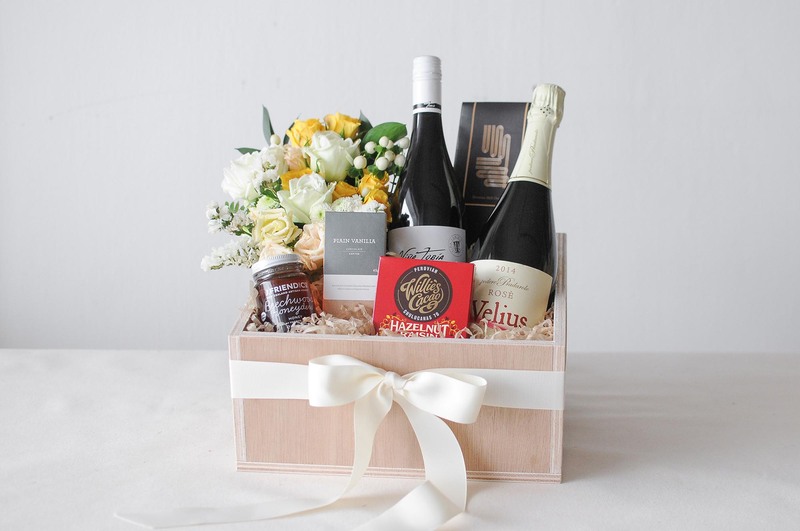 Your gift box order will be prepared as closely as possible to the images and product descriptions on our e-store. However, in the event of a supply difficulty due to seasonal or stock availability, we may substitute items with a similar item (from alternate brand or of a different flavour) of equivalent (or greater) value and quality. 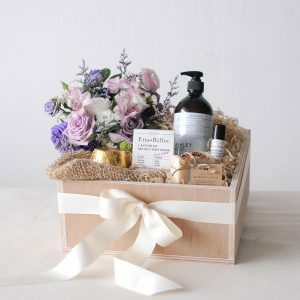 This may be done without prior notice to you but all our products have been hand picked by our team for their exceptional craftsmanship and quality, so please trust us to ensure that the quality and aesthetic of the gift box will not be compromised. Item(s) marked with an asterisk contain gluten, dairy, and/or nuts. If the intended recipient is allergic to any of these, do make a note in your order above under the field “Things to Note”, and we will replace the item with an alternative of similar value. The posies for our gift boxes are created using seasonal blooms in colours that best match the products featured. If the intended recipient has floral allergies, do make a note in your order above under the field “Things to Note”, and we will avoid using those blooms in your posy. Wooden box measures 305 x 305 x 140mm. These gift boxes are available for next-day delivery at a fee of $12 per delivery address. Place your order by 4pm the day before to have your gift box ready for collection or delivery the next day. 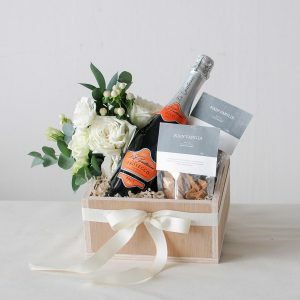 A same-day delivery service is also available, if you require the gift box at short notice. All same-day delivery orders will be dispatched from our studio by 4pm for arrival by 7pm; delivery charges are at $25 per delivery location. Same-day delivery orders must be placed by 12noon on the day of delivery. 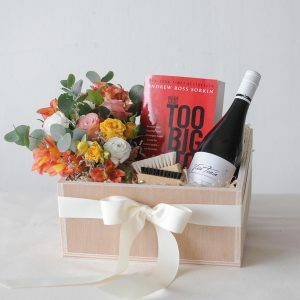 This gift box includes alcoholic drinks. We will require that the recipient be aged 18 years or older, with the appropriate photo identification for verification purposes. Our delivery team is instructed not to deliver packages containing alcohol to anyone who appears to be under the age of 18, and who is unable to prove their age with the appropriate photo identification. We may refuse delivery of any alcohol-related drinks or items to any person who is, or appears to be, under the influence of alcohol or drugs. In the event that a delivery is delayed or unsuccessful for reasons of the above, we can assist to arrange for re-delivery to a different location (or recipient) at an additional re-delivery fee of $25. The re-delivery will be arranged for the next soonest delivery timing; this may be on the same day as the original delivery date or the next day, and will be subject to the availability of our delivery slots.